Firefox Quantum made Firefox fast again, but speed is only part of the story. A ton of work has gone into making Firefox an exceptional tool for creating on the Web. Let’s dive into the changes coming in Firefox 58, currently available to preview in Firefox Developer Edition. Following the success of Firefox’s powerful CSS Grid Inspector, we’re excited to introduce a Shape Path Editor for elements with a clip-path property. Try it yourself on this CodePen by Chris Coyier. We’ve also implemented the CSS font-display property, allowing authors to specify how long the browser should wait for a web font, and when it should consider swapping in a font once it’s loaded. Firefox Quantum also introduced a brand new CSS engine (“Quantum CSS”) which fixed numerous bugs and inconsistencies with CSS in Firefox. For example, calc() now works everywhere that the spec says it should. 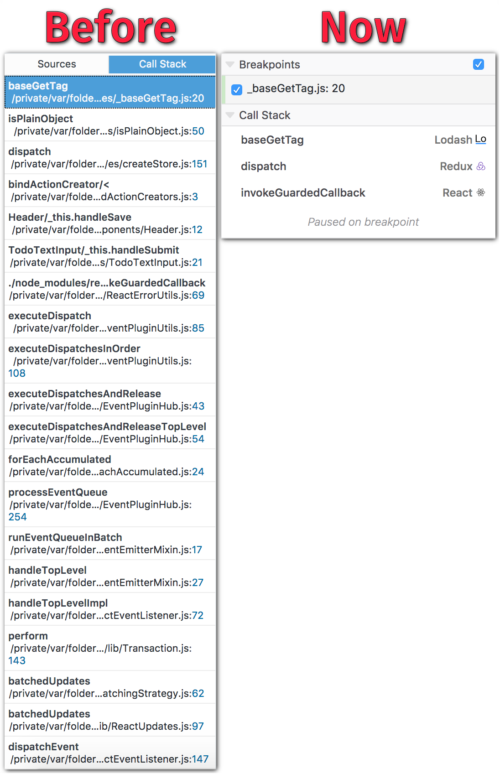 You might also notice that the debugger recognized Webpack, and appropriately labeled it in the Sources tree. We even implemented “sticky” breakpoints that intelligently move with your code when you refactor or rearrange declarations in a file. The other tools have also improved: console groups can now be collapsed, the network monitor can be paused, etc. The best way to discover the new DevTools is to download Developer Edition and try them yourself. Firefox is driving new, fundamental capabilities of the Web. Firefox 55 introduced support for WebVR on Windows, and included experimental support for macOS. With Firefox 58, WebVR now is supported by default on both Windows and macOS. If you’re interested in creating virtual reality experiences on the Web, check out the A-Frame library, or read our article on how Firefox Quantum delivers smooth WebVR performance at 90 fps. In other firsts, Firefox 51 was the first browser to support FLAC, a lossless audio format, on the Web. Until now, this support was limited to Firefox on desktop platforms (Windows, macOS, and Linux), but Firefox 58 brings FLAC support to Android. That means that Firefox, Chrome, and Edge all support FLAC on every platform but iOS. The PerformanceNavigationTiming API provides access to performance metrics related to page loading. Off Main Thread Painting (“OMTP”) has been enabled by default on Windows, which improves Firefox’s responsiveness by reducing the workload on the main thread. We’ve enabled budget-based background timeout throttling which slows down scripts running in background tabs to save further CPU resources. Lastly, Content Security Policies (CSPs) now support the worker-src directive. Query and observe changes to the browser theme, making it possible for add-ons to adapt themselves to fit in with arbitrary themes. We’re currently planning additional WebExtension capabilities for 2018, including looking into possibilities for hiding individual tabs, or the entire tab bar. These are just the highlights. To learn more about what to expect in Firefox 58—currently available in Beta and Developer Edition—check out the Release Notes and MDN’s Firefox 58 for Developers. It would be nice to have a websocket monitor or something similar to view the websocket messages. The add-on that did this is not working with quantum anymore. Any updates on this matter? We’re hoping to restore WebSocket inspection early next year. Bug 885508 tracks the necessary work to make this happen. Mozilla and the contributors have done an impressive amount of work in this area! One thing that I found a little disappointing about the permissions in WebExtensions is that while I’m told what the addon wants, I get no say in this. Is there any possibility that this might change? It’s very common for random addons to request access to all my tabs and websites. What if I only want to allow an addon to run on a specific website, or prohibit it from running on certain pages? That would be neat. The other thing that’s disappointing is that no addons ask for internet access, meaning that any addon requesting access to my history or tabs is a privacy risk. Firefox is a leader in pushing for privacy; addon internet access rights and per-site permissions would be a great addition to that. Selective permissions are a really interesting idea — what should an add-on do when a permission it wants is denied? How would you present the choices to users? Lots of tricky UX bits to solve, but worth considering. I’ll pass along the idea to the add-ons team. its pretty obvious, if the addon doesn’t have permission then either it disables whatever functionality depends on that feature or it breaks. Lots of addons/apps tend to ask for permission for stuff that isn’t directly related to their functionality. Its not firefox’s job to make sure that addons are well written, its firefox’s job to make sure users have control of what addons do and that addons have the api’s to do reasonable things. I would be more interested in reviving SESSION MANAGER. I mentioned Tab Mix Plus since this addon has session manager function which requires the same APIs as Session Manager. New WEs like “Tab Session Manager” or “MySessions” probably will also benefit from it (currently they are not very useful and still very buggy). The information on both pages seems not up to date. I need http://www.alexa.com/toolbar back. I can’t live without it. please devs. I’ll see if I can drop them an email. It should be trivial to port their Chrome version to Firefox. Unfortunately, WebSocket inspection didn’t make it into Quantum, but we’re hoping to address it early next year. Bug 885508 tracks the necessary work to make this happen. Guys, what with WebVR for Linux? Hello, I downloaded the new Firefox and was disappointed to see that my videos have been corrupted. All videos have a green/pink tinge to them. All other features appear to act normally. Do you have any suggestions on how to clear the picture? Sorry about the video issues! We were incorrectly identifying some AMD GPUs, causing the video corruption you saw. A hotfix should have rolled out today which fixes it. You can check for updates manually by going to Menu -> Help -> About Firefox. I wouldn’t mind that the classic XPCOM/XUL based add-ons are no longer supported, when there is a replacement for them in the WebExtensions API. The reality is that the classic add-ons are now indeed legacy (unless the user *Upgrades* to Firefox 52 ESR), without a proper replacement possible due to lacking functionality in the WebExtensions API. There should be a plan to ensure that the functionality of the top-50 add-ons (based on the classic XPCOM list of say two months ago) is in Firefox in about 3-4 months and then in about 6-8 months from now all functionality of the top-100 add-ons should be complete and then the missing functionality for the next add-ons should be added, until most of the add-on functionality used in the past is available again. We did our homework and proactively worked with as many add-on authors as possible in advance of Quantum’s release. Rather than wait for perfect, we decided to ship once we were confident that the APIs and the porting rates were good enough. The fact that over 6,800 compatible add-ons are currently available on AMO is a great testament to that work. However, we’re absolutely aware that we have more work to do, and we look forward to delivering on that in 2018. So is there chance that a widely used addon like Classic Theme Restorer will work in May 2019? Or aren’t there any plans to introduce currently missing API functions? There is a bug. Filed two years ago. – The design, buttons are tiny and the margins are huge (i need as much space as possible, i don’t have a 4K monitor) and white background is not appropriate. Hi, is it too much to ask for WebP image format support? I’ve been waiting for it for several years. It would reduce internet traffic by a significant percentage. Favorite top sites disappear and cannot be replaced. Instead if 12, I now have nine and three unloadable blanks. Previous versions had 15 loadable favourite top sites. My iSkysoft Video Converter won’t download mp3 on Youtube anymore..it says it is not compatible with this Firefox version…any help? well debugger and console messages listing > in previous versions were able to find function definition in code. When function was written in console and clicked. Also it was possible to just click on console log right part(there was page and line number) and see when message came from after click. Currently this does not work on most pages > sometimes it opens viewsource: which seems to find position. But most of time it opens debugger and stops at start of page/script js. It does not work – I thing it got broken in 56 or something like that – this behavior is present in current FF developer 58.0b6. Worst thing is that it behaves differently on same page. In Chrome it works and in FF52 ESR it works also. Just new Firefox is broken. I hope that you will be able to fix this, that is much more important than having new functions, when basic ones does not work. Extensions like vimperator / fireguesture wouldn’t work on any tabs ( include about:, not found url and etc..) , but it must do, like at ff56-. I think we all love the faster firefox quantum. But you have to know that we all do hate to lose the extensions that we had for 10+ years. We need more API features. Right now it is still better then Chrome and other browsers, but it is not that special flavor, like it used to. I hope you and the team will put a lot of effort to get that flavor of firefox back. Yes I do miss them a lot! You need to address this DRM issue…..I was skeptical of downloading the NEW Firefox as I usually follow the rule “If it isn’t broken don’t fix it” but I did update to quantum and immediately my Netflix quit working in Firefox…as i researched the net I found out a LOT of people are having issues. So I have now downloaded Chrome which i have never done before and it works just fine with Netflix…(this is how you lose users and donations)…..also issuing new or statements about bugs would go along way in saving you users and donations instead of not saying a word about knowing about the issue and a time frame to fix it so users don’t go to other browsers. There is no way to enlarge the fonts on the menu bars, tool bars, tabs, etc. And Theme and Font Size changer no longer works with Quantum. The font size is critical to some of us. Good news and it’s getting better with each update. I still miss the color/colour control in the style editor, simply having the hex/rgba color code available isn’t helpful. In firebug you had the option of opening a color picker which was awesome, I appreciate it’s available in the inspector but having it also in the style editor would go some way in making this perfect for my front end needs when planning or changing colour/color in development. Any idea when Private Tab will work again? Needing a different window for each kind of tab is really the biggest drag I’ve experienced with Firefox 57. You think it better well not for us very long time Firefox users it’s not. I lost everything and it looked terrible I guess I’m old school. I have been using firefox at home, work, forever. All you did was make it more chrome like. I had to revert back to 56 to get back where I was. No more firefox updated for me ever, and I’m not alone. Do you know if/when “global keyboard shortcuts” will get added to extensions? The one thing I miss sorely from Chrome is the ability to map my media keys to Google Music, so I can pause, play, skip songs from my keyboard. Any updates on this that you’re aware of? It’s fun to read about all the mentioned bells and whistles, but what about bringing WebExtension API closer (by capabilities) to its predecessor? E.g., bookmarks API is still, politely saying, incomplete. The corresponding bug, 1225916, lives in unassigned state for 2 years, but developers seem to be quite calm about that. Definitely, bringing WebExtensions API to a state when it can be at least partially as capable as XUL is of much less fun and priority. Personally, I see few advantages in quicker debugger, more control for CSS authors and rest of the above blah blah blah, if useful add-ons remain crippled just because developers abandoned working on API. Note that you have already banned old API, without providing fully functional new one. Applause. Don’t understand this technical stuff but I was hoping that Firefox would stop frozen web pages and stalling. It has not. What can be done?